This is another in a series of little hand warmers for 2012. Even though winter has not officially arrived for us in the Land Downunder, it has already send envoys on unexpected days to remind us how "brrr" it can get. The the "brrr" is always a good incentive to get the mind and fingers onto making winter woollies. Anyone into handmade crafts will truly enjoy the uniqueness of this piece. This set of gloves has a racy yet feminine look - ideal for work and play. The picot edges and the open crochet work gives it the feminine touch in delightful pink. The baubled banding adds additional warmth, texture, and wrist support. And the line of bright turquoise blue brings the colors to life. Extremely simple to wear. Just pull on and be Warm! There is no right or left side - can be worn interchangeably. 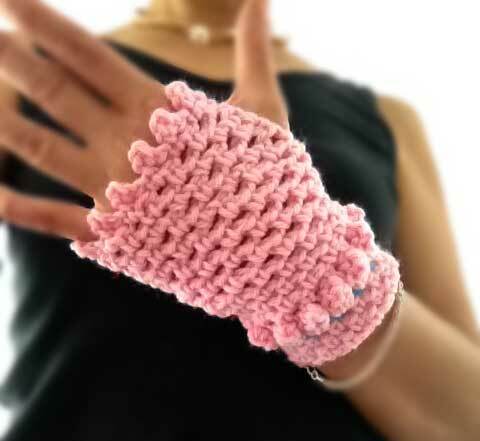 I am just putting down some notes on the making of this pair of open crochet work fingerless gloves. It will make more sense if you already know some basic crocheting. The body is comprised of [triple crochet + 1 chain] - repeated in the round. The following row is made by placing the [triple crochet] over the chain and continuing with the [triple crochet + 1 chain] pattern. Start by getting a length that will fit semi-snug and comfortably around wrist and hand; join and continue working in rounds. You begin at the band which has the same pattern of [triple crochet + 1 chain]. 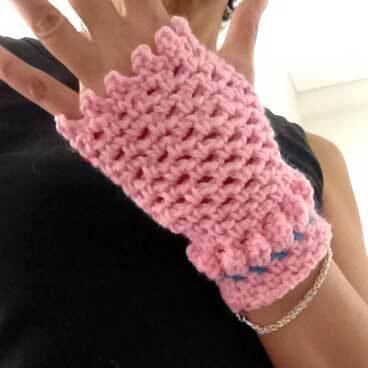 To ensure that the wrist band is a tat snugger than the body of the gloves, I used a smaller crochet hook (Clover 4/0). I changed to a larger hook (Clover 5/0) after the baubles. The row of baubles is made thus: 4 Triple crochet into one stitch, then join the 4 Triple crochet together to make a Bauble. 1 Chain. Make another Bauble.